The Americans and Kansas City Mavericks play a one-game series on Friday night. The Americans trail the Kansas City Mavericks by nine points for the final playoff spot in the Mountain Division. The Americans are coming off a 2-0 shutout win in Wichita on Tuesday night. The Americans scored on the power play, shorthanded and with an empty net, in a 5-3 victory over the Kansas City Mavericks on January 2nd at Allen Event Center. Adam Miller scored two goals, while Spencer Asuchak, Chase Lang and Braylon Shmyr also lit the lamp. CJ Motte made 31 saves to earn the win. Zach Pochiro leads the ECHL with 26 goals. *CJ Motte leads the league in saves with 1056. 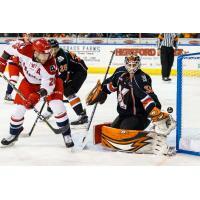 Rookie Kyle Hayton recorded his first professional shutout on Tuesday in Wichita. Riley Bourbonnais has points in seven of his last nine games (5 goals and 6 assists). Zach Pochiro is tied for the ECHL lead with 11 power play goals. Zach Pochiro is tenth in the league in scoring with 46 points. Rookie Alex Breton has scored in back to back games and is third in the league in defenseman points with 31. Mason McDonald is tenth in the league with a 2.47 GAA. Mark Cooper was loaned to San Antonio of the AHL on 2/7/19. Rocco Carzo is the active points leader with 34 (12 goals and 22 assists). Darian Dziurzynski leads the Mavericks in goals with 17 and is currently on a 4-game point streak. The Americans trail fourth place Kansas City by nine points in the Mountain Division, however KC has eight games in hand on the Americans. Joel Chouinard will miss tonight's game with a lower body injury. The Americans lead the league with 1049 penalty minutes. Allen is 10-17-3-2 on the road this season. Kansas City is 14-2-1-0 when scoring first. The Mavericks are 19-15-2-0 against the Mountain Division.